Subject: Antique print, untitled. Small landscape with two men and a horse in a stable in the right foreground. A manor in the middle background. Condition: Good, given age. Margins cropped to the image edge. Some faint soiling in the top edge of the image. A small crease in the top right corner. Remains of attachment to carrier on rear top. General age-related toning and/or occasional minor defects from handling. Please study scan carefully. Medium: Crayon style lithograph on hand laid paper. 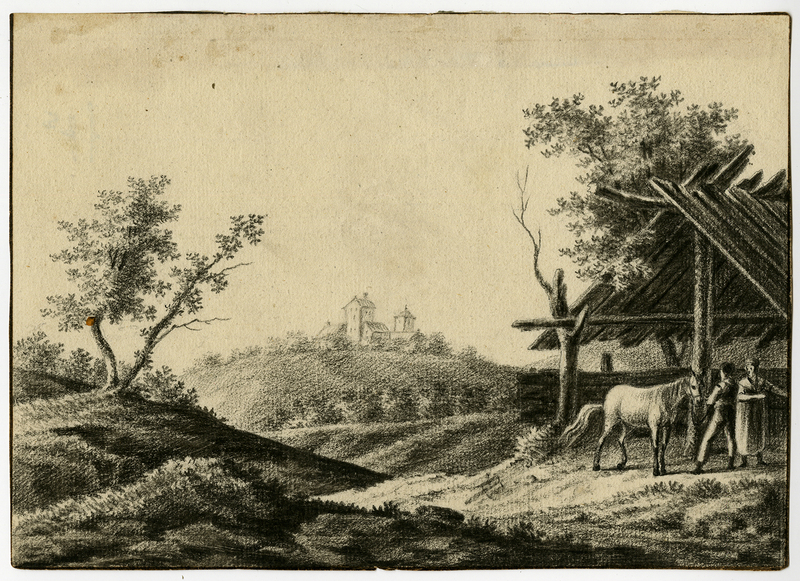 Watermark: W.W. & H. Pannekoek (=Veluwe, 1st 1/4 19th century). Size (in cm): The overall size is ca. 19.9 x 14.3 cm. The image size is ca. 19.9 x 14.3 cm. Size (in inch): The overall size is ca. 7.8 x 5.6 inch. The image size is ca. 7.8 x 5.6 inch.